The initiation of a cell signaling event relies primarily on interactions between molecules in the extracellular and cellmembrane space. Different types of molecules can serve as extracellular signals (Fig. 1a) : hormones, cytokines, growth factors, and neurotransmitters secreted from distant or neighboring cells; antigens or antibodies free in solution or attached to (migrating) leucocytes or foreign (e.g., virus) cells; small soluble molecules (i.e., <1000 Da; ions, metabolites); and the extracellular matrix. Except for lipid-soluble signaling molecules that can migrate through the lipid bilayer (e.g., steroid hormones and NO gas), transmembrane proteins are involved in transferring the molecular signal into the target cell. Small soluble molecules can be transported across the plasma membrane by channel and carrier proteins or cell-cell GAP junctions, which provide an electrical and metabolic coupling with the extracellular space and neighboring cells, respectively. Larger soluble or tethered molecules, including filaments from the extracellular matrix, require a specific interaction with a transmembrane (co-) receptor for signal transduction across the membrane. The transmembrane protein undergoes an intramolecular conformational change or change in the quaternary structure (e.g., dimerization) upon binding of the extracellular molecular signal. 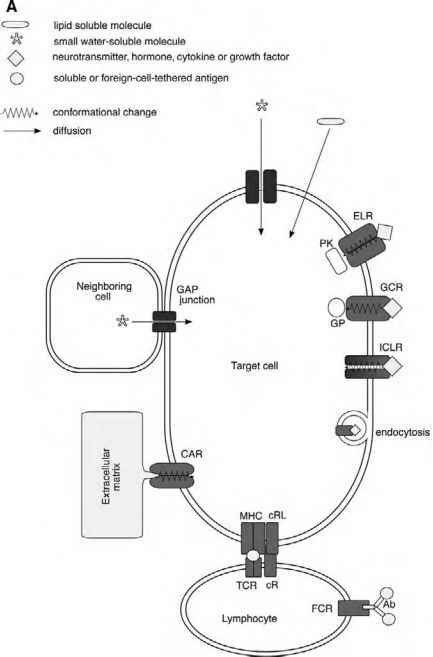 It is noncovalently or covalently linked either to an ion channel that allows the change of the ion traffic across the membrane or to intracellular membrane-proximal components that are activated to induce an intracellular signaling cascade. In the latter case, the receptor can contain intrinsic enzyme (e.g., phosphorylation) activity, such as the receptor tyrosine kinases; recruit relevant intracellular enzymes; or associate with G proteins, which in turn activate kinases or ion channels. While the transmembrane signaling process mediated by (ion) channels is immediate and brief, enzyme-linked receptors manifest a slow and more complex molecular mechanism but can achieve a great amplifying signaling effect. 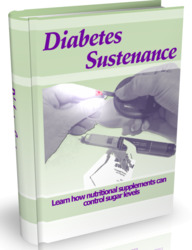 Subsequently, gene expression in the nucleus or other cell activities are affected. Recent studies have shown that endocytosis of transmembrane receptor complexes can be used to deliver the complex and affect activities at distant locations in the cell . A careful regulation and coordination of the communication within the molecular signaling society is essential to the initiation of a signaling event, especially in the more complex multicellular organisms. Any molecular interaction, such as that between a receptor or receptor subunits and ligand molecules, is determined by the effective local molecular concentrations and (apparent) dissociation constants. 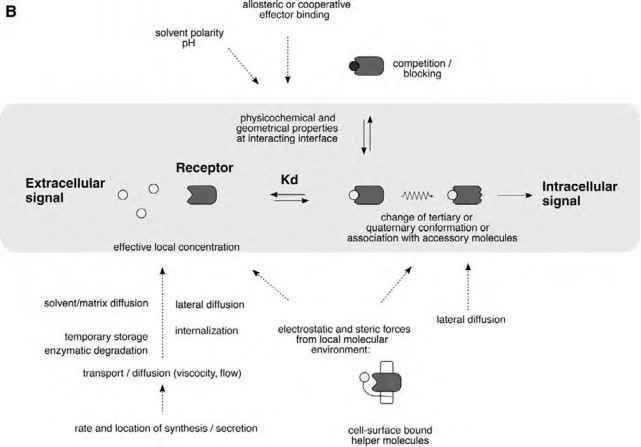 The concentrations of the signaling and receptor molecules can be controlled by various factors at different stages along the path toward an encounter (Fig. 1b). After synthesis or secretion, enzymatic degradation or temporary storage can influence the concentration of the signaling molecule, whereas lateral capping and endocytosis can alter the density of receptor molecules at the membrane surface. A rapid turnover of signals and receptor molecules is required to respond to fast changes in the environment. Signaling molecules may have to travel far (e.g., endocrine signaling) and depend on fluid streams of the vascular system and diffusion to enable an encounter with their target. The gel-like layer of proteoglycans in the extracellular matrix can serve as a selective molecular sieve to regulate the traffic of migrating cells and signaling molecules. Figure 1 Transmembrane signaling paradigms: (a) molecular interactions and mechanisms, and (b) control of an interaction between a (oligomeric) receptor and (oligomeric) ligand. Extracellular signaling molecules are yellow; channels or carrier proteins and receptors are blue and red, respectively. Lipid soluble molecules comprise hydrophobic or small uncharged polar molecules; small water-soluble molecules comprise inorganic ions, sugars, amino acids, nucleotides, and vitamins. 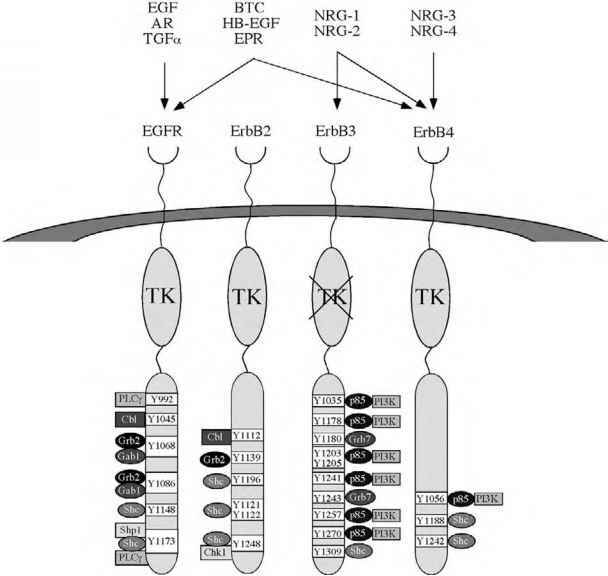 ELR=enzyme-linked receptor, GCR = G-coupled receptor, ICLR=ion-channel-linked receptor, PK=protein kinase, GP = G protein, Ab = antibody, MHC = major histocompatibility complex, TCR=T cell receptor, FCR=Fc receptor, cR=coreceptor, cRL = coreceptor ligand, CAR=cell adhesion receptor. interactions, (e.g., clustering of receptor-ligand complexes). Some complexes may be very weak on their own and require accessory proteins or coreceptors for stability or activation; for example, CD4 and CD8 coreceptors in the major histocompatibility complex (MHC) multicomponent complexes help to strengthen the adhesion between a T and antigen-presenting cell. Also, low-affinity antibody-antigen interactions may be amplified by multivalent cross-linking. Furthermore, the apparent affinity for the extracellular signaling ligand can be decreased when another molecule (i.e., antagonist) competes for the same target-binding site. These control mechanisms that regulate the signaling interaction network are similar to those that control other biomolecular interactions such as enzyme-substrate interactions. However, altering the affinity of an assembly by covalent modifications (e.g., phosphorylation) is more common in intracellular signaling, where a large repertoire of modifying enzymes is available.